The “Delphi Initiative” is a network of (mainly, but not exclusively) European intellectuals who oppose the attempt of international Finance and big international corporations to impose a dictatorship all around Europe. We believe that this is what the present day “European elites” are trying to realize. This is the real “agenda” behind the “Debt Wars” against specific European nations, behind the radical transformation of the EU into a structure dominated by big banks and, also, behind the TTIP. Thοse intellectuals reject also categorically an international policy of War, which is the “external” compliment of the “social wars” launched inside the European Union. They reject the new “Cold War” against Russia (or China tomorrow), the very Hot War against the Arab and Muslim world, (which is not but the realization of the project of the “Clash of Civilizations”, elaborated by Samuel Huntington and others) and, of course, they oppose the culmination of all that into the War against Nature, organized by big international corporations, international Finance and many governments and states controlled by them. Interventions in the Middle East did not led only to the nearly complete destruction of a number of important states of this region. They provoked also a serious refugee crisis and terrorist attacks in Europe. The refugee crisis and the terrorist threats are now used as the “perfect pretexts” to curtail democratic rights of working people in Europe and to attack, once more, specific European nations, thus advancing the project of turning EU into a totalitarian structure (or, alternatively, destroying it by a chaotic procedure into a myriad of small states, clashing between themselves and unable to oppose “globalization”, neoliberalism and imperialism). The opposite is also true. More totalitarian becomes the EU, more its peoples and nations loose their rights and power, easier it becomes to launch new wars against Russia, “Islam” or Nature. 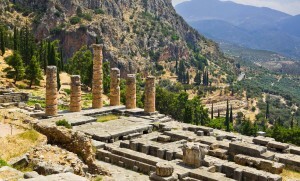 The idea of a “Delphi Initiative” was born out of the discussions during an international conference, held near Delphi, Greece, in June 2015, just weeks before the culmination of the Greek crisis. The conference was devoted to the need for an elaborate strategy to develop national and European strategies and alternatives against “euroliberalism” and, also, coordinate actions against Wars with Russia or in the Middle East ( https://www.youtube.com/channel/UCnzRNIZ79dczuuJStgo3tFw). Our aim is to facilitate exchange of news and ideas about EU and international crises, on both their “internal” (including ecologic) and their “external” dimensions, especially in the three “fronts” directly affecting Europe (relations with Russia and BRICS, Middle East, world economy) and to help a serious dialogue between like-minded persons and forces, towards the elaboration of a coherent alternative to “euroliberalism”. We named our website “defend.democracy.press”, because the question of democracy, of who really holds power in Europe now, both inside our states and in the Union, is really the crux of the matter. What we witness, especially since the beginning of the EU crisis, in 2009-10, but also with events in Ukraine or the Middle East, is the result of a long and silent “coup d’ état”, which has permitted to the most radical and politically coherent wing of the Finance to control to a large extent our states, governments and the EU institutions, often in alliance with geopolitical centers of power outside Europe. If we don’t manage to take this power back, European civilization, or what it still remains of it, is doomed to perish. The whole world will suffer as a result. The Delphi Initiative is supported by the World Forum of Alternatives, the Institute for Globalization Studies and Social Movements (Russia), the Geopolitical Economy Research Group (Canada), the Lyssarides Foundation (Cyprus), the Athens Development and Governance Institute and the website Agora-dialogue.com. We would like to underline also that we don’t post in our website only materials with which we agree, but any we consider of some importance. Participants and friends of the “Delphi Initiative” do not have any wish (or any possibility for that matter!) to “replace” existing parties or other structures. The Delphi Initiative remains open to cooperation with anybody interested also in its goals. We are deeply convinced of the need of the wider possible cooperation for the achievement of our goals and also of the necessity of not avoiding any subject, but of discussing deeply and frankly, without preconditions a priori exclusions, all problems we face. We are definitely against any sort of “political” or other “correctness”.